Apple this week updated a support page for the Apple Watch, revealing that the ink found in some tattoos on the wrist can in fact affect the heart rate monitor, and associated wrist detection feature, for the new wearable device. "Permanent or temporary changes to your skin, such as some tattoos, can also impact heart rate sensor performance," the newly updated product support page reveals. "The ink, pattern, and saturation of some tattoos can block light from the sensor, making it difficult to get reliable readings." Apple notes that users who are unable to get a consistent reading can still connect an external heart rate monitor, such as a Bluetooth chest strap, if they wish to get a pulse reading while working out with their Apple Watch. Some early adopters of the Apple Watch took to Reddit earlier this week noting that dark wrists tattooed with black ink seemed to interfere with the heart rate sensor. This sensor goes beyond just heart rate, however, and serves as a secure —but optional —authorization and automatic unlocking mechanism for the Watch. 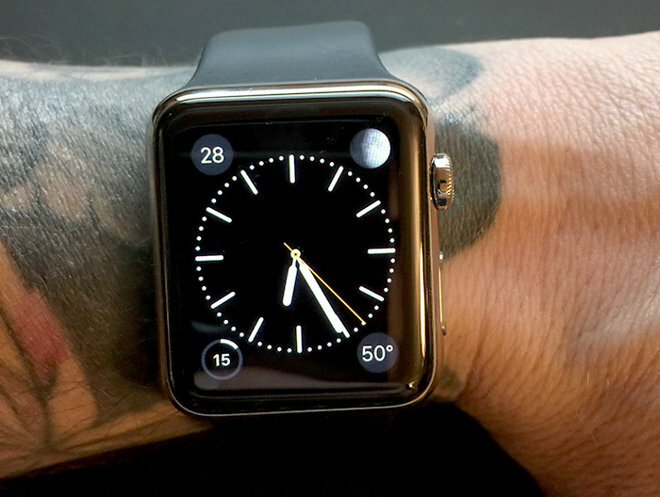 Users with dark wrist tattoos can turn off wrist detection entirely to solve the problem. The heart rate sensor on the Apple Watch uses a method known as photoplethysmography, which flashes infrared and/or green LED lights to detect blood flow.